The five-star prospect's mom Rhonda Banchero-Smith and father Mario Banchero played at Washington, and his mom played pro hoops. Sheryl Swoopes’s pregnant belly gracing the cover of Sports Illustrated’s premier issue of Women Sport in 1997 was a plot twist for the basketball community. Daughters of NBA players also showing talent on the court is common. WNBA guards Lexie Brown (Dee) and Kaela Davis (Antonio), plus forwards Xylina McDaniel (Xavier) and Taya Reimer (Ben Davis), who play professionally overseas, are a few. But what about sons of mothers who played at the highest level? Washington has been incubating its own since 2002. Although Franklin grad Rhonda Smith and O’Dea alum Mario Banchero attend high-school 4 miles apart and both graduated in 1992, they didn’t begin dating until their senior year at the University of Washington. Smith was an accomplished, 6-foot-3 forward for the Huskies women’s basketball team while Banchero was a 6-4 tight end for the football team. “We joke and say that when we met at UW, we kind of looked at each other and were like, ‘Gosh, if the two of us had kids, that could be something,’ ” Banchero-Smith said. A 6-9 O’Dea sophomore, Banchero is a five-star prospect for the Class of 2021 with five college offers, including Washington. He’s leading the No. 11 Fighting Irish (16-8) to their second consecutive Class 3A boys state tournament appearance. Glimpses of his mother’s talent dot each game Banchero plays, but his game is nothing like his mother’s. Smith-Banchero starred for the Seattle Reign in the defunct ABL and played short stints in the WNBA and overseas, retiring in 2002. Smith-Banchero was a traditional post. She graduated from UW in 1995 as the program’s all-time leading scorer (1,801 points) and third-leading rebounder (803). But she made sure her son began learning the game at the guard position. Mix in his father’s football knowledge — Paolo played quarterback until last season — and Banchero’s game is so fluid, you forget about his size until standing next to him. “She definitely pushes me to do better, even if I have a big game,” said Banchero of his mother. He’s averaging a team-leading 17.7 points, 11.1 rebounds and 4.7 assists per game. Living comfortably in Mount Baker with a view of Lake Washington, the former athletes want their children to understand you can be successful in other ways than sports. And early-on, Paolo seemed like he’d be an average player despite his height — which is fine. His mother was an aggressive player who showed a lot of emotion on the court. Paolo was more casual, quieter and unselfish. O’Dea coach Jason Kerr declined to be interviewed, but according to Paolo it was Kerr’s “intimidating” style and not getting much playing time as a freshman that helped Banchero dedicate himself to his craft. Participating in USA Basketball’s junior national team minicamp last summer added another layer of knowledge in Banchero’s development. Those coaches told him he needs to communicate more on the court. Banchero’s father likely had the best advice. And that’s to follow his mother’s footsteps and become a professional athlete. Top storylines: Eastside Catholic, Rainier Beach, Marysville-Pilchuck, and Mt. Spokane earned byes from regional-round wins last week. The teams open state play Thursday in the quarterfinals. Top-seeded Eastside placed fifth last season. … No. 6 seed Lincoln is a seven-time Pierce County League champion but hasn’t advance to the state championship game since winning it all in 2002. The Abes placed fourth at state last season. … Garfield, the defending champs, didn’t advance to the tournament for the first time since 2010. … No. 4 Marysville-Pilchuck is making its first appearance since 2015. The Tomahawks won their first WesCo 3A title since 2012. … Second-seeded Mount Spokane is back in the tourney for the first time since 2008. … The Metro League advanced five teams to state. Players to watch: Marysville-Pilchuck F RaeQuan Battle, Sr. (Washington-commit averaging 21 ppg and 8 rpg. ); Rainier Beach G MarJon Beauchamp, Jr. (five-star recruit averaging 26 ppg. and 11 rpg. ); Kelso F Shaw Anderson, Sr. (averaging 28.5 ppg. ); Ingraham F Mitchell Saxon, Jr. (averaging a double-double); Eastside Catholic F JT Tuimoloau, So. (five-star linebacker helped Crusaders win football title in December. Averages 13.8 ppg and 7.8 rpg as a starting forward). 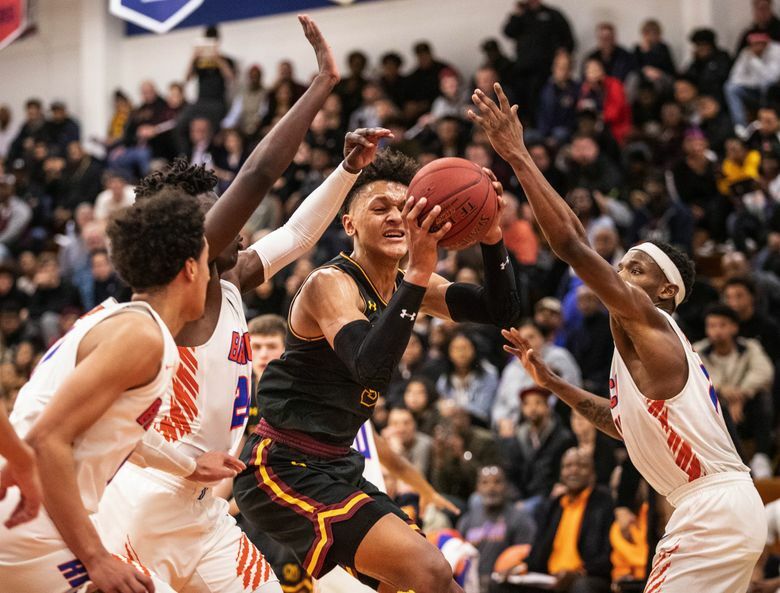 Favorites: Third-seeded Rainier Beach (defending state runners-up); Sixth-seeded Lincoln (senior-laden team led program to its ninth-straight state appearance); Second-seeded Mt. Spokane (riding a 19-game win streak). Last: Ingraham’s storybook season continues with its first state tournament appearance since 1975 when it placed eighth. The Rams won the title in 1969 with Washington state Governor Jay Inslee on the roster. Jayda Evans: 206-464-2067 or jevans@seattletimes.com; on Twitter: @JaydaEvans. Jayda Evans covers prep sports. She offers observations, critiques, occasional offbeat tales and answers to select email inquiries. Evans also has written a book on the Storm and women's hoops titled, "Game On!"